Spaceships traveling at speeds faster than light is a staple of science fiction writers, who call the concept by many names, including hyperspace, hyperdrive, warp speed and subspace. One famous example is "Star Trek," where the starship Enterprise jumps from star system to star system to visit other planets. "If Captain Kirk were constrained to move at the speed of our fastest rockets, it would take him a hundred thousand years just to get to the next star system," said Seth Shostak, an astronomer at the Search for Extraterrestrial Intelligence (SETI) Institute in Mountain View, Calif., in a 2010 interview with Space.com's sister site LiveScience. "So science fiction has long postulated a way to beat the speed of light barrier so the story can move a little more quickly." However, the lack of research and scholarly discussion on the transportation method make it more often a convenient literary device than scientific possibility, Shostak said. In reality, the concept of hyperspace is "a lot of hype," Shostak said. The Millennium Falcon spaceship makes the "jump to light speed" in the movie Star Wars Episode IV: A New Hope. Physics suggests that shortcuts through space do exist, Shostak said. The curved nature of space was first proposed by Einstein, and quickly led to the idea of a wormhole: a portion of space that curves in on itself, connecting two otherwise distant parts of space. A spacecraft could theoretically skip ahead to a distant region of space if it enters such a wormhole between the two locations. As in our familiar universe, objects in a wormhole would have to travel slower than the speed of light, which, in a vacuum is 186,282 miles per second (299,792 kilometers per second). But, a spaceship could appear to have exceeded this limit by traveling through a wormhole and reaching a star system thousand of lights years away in a matter of hours, for example. However, our access to these inter-space freeways would be limited by the size of the portal. "Wormholes, we think, are made all the time on a microscopic level," Shostak said. "But the question is, can we actually use them for transportation?" Finding or creating a wormhole that's going to the right place and scooting through it before it closes up and smashes your spaceship to pieces are two unsolved problems that the laws of physics don't clearly bar or allow. Technically, it would be possible to warp space to create wormhole if one could place a very dense piece of mass in front of their ship, Shostak said. Perhaps similar to the "hyperspace engine" seen in the "Star Wars" movies, the object would distort the shape of space around it, essentially bringing the chosen destination closer to the ship. But the object would need to have the density of the center of a black hole in order to work. "The problem is, where do you get the black hole and how do you get it in front of your spacecraft?" Shostak said. "It's sort of like, how do you create something that will warp space and then put it in front of your spacecraft?" A related science fiction idea is teleportation — the possibility of instantly conveying a person or ship into another part of the universe. The phenomenon is seen in "Star Trek," where the so-called transporter deconstructs one's body and reconstructs it at another, distant location. There is some scientific basis for this idea — scientists have shown that subatomic particles can be moved from one point to another faster than the speed of light, said physicist Ian Durham at Saint Anselm College in a 2010 interview. But the ability to break apart and reassemble an entire human appears impossible, Durham said. Because of the randomized aspects behind the arrangement of subatomic particles, perfectly reversing them becomes increasingly difficult as they accumulate in greater numbers. While hyperspace is not a current form of space travel, there is ongoing research to determine how viable it is — and what the experience would be like. In 2013, a group of physics students corrected the view of what happens when spaceships fly at the speed of light. The familiar special effect of streaks of light (seen in "Star Trek," "Star Wars" and other series) would not actually be the case. Instead, the view would appear more like a centralized bright glow. The fast travel would cause light to shift into longer wavelengths due to the Doppler effect, which also explains phenomena such as why the sound of a car horn changes before it passes an observer and afterward. In space, humans would not be able to see starlight because its wavelengths would be stretched into the X-ray spectrum. Also, the glow of the universe — which glows in microwaves — would become visible because its light would be stretched into the visible spectrum. What makes the EmDrive interesting is the engine doesn't use any propellant, instead functioning through reflecting microwaves inside of a chamber. A peer-reviewed paper in 2016 (led by Harold "Sonny" White of NASA's Johnson Space Center) said that despite this different design, a variant of the EmDrive does produce thrust. Two other successful tests were reported in 2012 (by a Chinese team) and in 2013 (by the same NASA team). Meanwhile, some researchers have said this engine violates Newton's third law of physics, which (simply speaking) says that every action produces an equal but opposite reaction. These are few of the many examples of warp drives used in science fiction, with an emphasis on television series and movies. An early mention of warp drive (many sources say it was the first mention) was in the 1931 novel "Islands of Space," by John W. Campbell. The plot in part concerned testing of faster-than-light ship. "Doctor Who": In this long-running British series, a machine called the TARDIS (which stands for Time and Relative Dimension in Space) can transport the occupants through space or time, plopping them down in exact locations in the universe. The lore of the TARDIS is as sprawling as the "Doctor Who" series itself, which began in 1963 and continues to this day. Famously, a TARDIS looks bigger on the inside than it does on the outside. Some versions of a TARDIS look like an old British police box. "Dune": In this series of novels by Frank Herbert, the Holtzman Drive takes colonists to far-flung locations. This drive takes ships around the universe by warping space. "Star Trek": This is the most famous example of warp drives, which were first brought up in the 1967 episode "Metamorphosis." Essentially, the device works through matter-antimatter reactions and can easily propel interstellar ships between star systems. The newest spinoff, "Star Trek: Discovery" (which premiered in 2017) uses another propulsion system called the "spore drive," which can travel almost instantaneously between different locations. "Star Wars": This universe has certain ships that use a hyperdrive. The use of "hypermatter particles" allows a ship to go at the speed of light and then move in between stars in an alternate dimension called hyperspace. The hyperdrive (and the famous view of star streaks seen by the people operating it) was first seen in the 1977 movie "A New Hope" and has been a staple of the series ever since. "The Hitchhiker's Guide To The Galaxy": The Infinite Probability drive worked on sort of a quantum model, where it would transport people to one of the least improbable locations you'd expect. Originally a 1978 BBC radio comedy, the story rapidly expanded into books, television and a movie. "Farscape": The universe of "Farscape," a Syfy network series that ran from 1999 to 2003, includes living ships called Leviathans. Some Leviathans have a starburst ability that lets them travel faster than light in case of emergency. "Battlestar Galactica": This ship, from a 1978 TV series of the same name and its reboot from 2004 to 2009, had a faster-than-light (or FTL) drive that it used to try to stay one step ahead of the menacing Cylons, mechanical beings who rose up to take revenge on their human creators. The cool thing about FTL drives was that it was hard to track a ship's location between "jumps," making it easier for the ship to evade the Cylons. Additional reporting by contributor Zoe Macintosh. 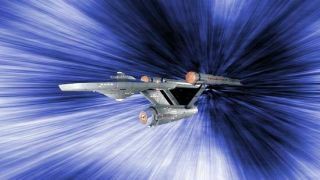 NASA: Is Warp Drive Real?